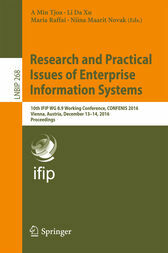 This book constitutes the proceedings of the 10th International IFIP WG 8.9 Working Conference on Research and Practical Issues of Enterprise Information Systems, CONFENIS 2016, held in Vienna, Austria, in December 2016. The conference provided an international forum for the broader IFIP community to discuss the latest research findings in the area of EIS and specifically aimed at facilitating the exchange of ideas and advances on all aspects and developments of EIS. The 25 papers presented in this volume were carefully reviewed and selected from 63 submissions. They were organized in topical sections on: semantic concepts and open data; customer relationship management; security and privacy issues; advanced manufacturing and management aspects; business intelligence and big data; decision support in EIS; and EIS-practices.